Although I started LIWI at the beginning of 2015, you don’t need to wait until January to begin. You can dive in at any time. A lot of readers have decided to take on the challenge after reading about how it’s helped me with my wardrobe, shopping, and style. Some of those readers share their updates in the comments section of my LIWI updates, and anyone who wishes to do so is welcome to play along and report in on how the challenge is going for them. This post will be all about my experience, but if you want to see how others are navigating the challenge, I invite you to read the comments. Questions are also welcomed! Since this update covers two months instead of one, I won’t be quite as detailed about what I wore as I usually am. However, I will provide some overall numbers here before I dive into the “meat” of this update. So you see that my numbers are pretty similar. I wear about 40-45 pieces of “out and about” clothing each month on average (I wore 39 items in July and 46 in June) and 7-10 pairs of shoes (I wore 9 in July and 10 in June). These numbers were all higher earlier in the year, but have leveled off as I have continued with the challenge. Since the weather has been very warm, I haven’t been interested in wearing scarves, but I have renewed my love of necklaces after challenging myself to wear them more often. Time will tell if I get back into wearing scarves once the weather cools down next month. I haven’t been tracking how often I wear my jewelry pieces, but I have noticed that I tend to reach for the same ones over and over again. I think I may be able to let go of some more before the end of the year. Jewelry doesn’t take up a lot of space, but other than sentimental pieces (and I don’t have that many of those), I only want to hold on to things that I love and wear on a regular basis. The size of my working closet (for non-workout/lounge clothes) as of today is 111 items, which is an increase of 5 items over my last update. This number may be a bit on the high side (I guessed that 100 might be my “magic number”), but I’m going to let the challenge do its magic and not second-guess it too much. I did pull some items out of my working closet recently, which I will discuss below. I also plan on doing another round of the “KonMari Process” before the end of the year and I’m sure I will find at least a handful of items that no longer “spark joy” for me – or maybe never did. I have yet to wear these 12 items during 2015. These are mostly the same items I covered in my July LIWI update, but I have since worn one pair of shoes mentioned there (the pewter sandals – have now worn them three times and wondered why I hadn’t been wearing them before) and decided to pass on one of the jackets (grey casual jacket with black trim). I definitely think I will pass on more of the unworn items soon, but I haven’t taken the time to do any culling over the past few months. I have yet to wear these six jewelry pieces this year. Not too many jewelry “benchwarmers,” so I think I am doing pretty well. Yes, it would be great to have no benchwarmers in any area, but I am happy to just keep going with this challenge and release things when I feel ready to do so. I am not in a huge hurry or aiming for perfection. I just want to be making good progress and I feel that I am in most areas. Of course, there are bound to be ups and down and that has been the case for me with overshopping (as I wrote about here). I could beat myself up about it and sometimes I do, but that never helps me to improve. When I falter, I try to forgive myself, recommit, and move forward. Sometimes it feels like I am on a treadmill and aren’t getting anywhere, but if I look objectively at how I’m doing overall, I can see a lot of positive changes. The fact that I am wearing more and more of what I have is definitely a step in the right direction. I recently decided to take another look at my “working closet” to see if everything in there really belongs. What I found was a number of items that had been worn only once, as well as some things that I am not all that excited about for various reasons. I opted to move all of those garments and shoes back over to the other side of my closet (what I’m now terming the “staging area”), in essence putting them on a sort of “probation.” This way, I will need to see if I feel “called” to wear them again – and if I love them when I do – before they can come back into my working closet. In all, I removed 14 garments and 7 pairs of shoes from my working closet due to lack of wear or an uncertain status (I’m not sure I really love them and want to wear them). These items are shown below and I share a bit about why I have opted to place them on “probation” status. These 14 garments were placed on “probation” during October 2015. I think my decision to re-evaluate the items in my working closet was a good one. There is no use keeping things in my closet if they aren’t serving me well. I would guess that most of my “probation” items won’t be making their way back into my working closet, but I think a few of them will. I will see how things go the rest of the year. If I opt to do the “KonMari Process” soon, I will probably find that most of them won’t “spark joy” and I will send them on their way to new homes. I really have a much better sense of my style now than at the beginning of the year and I love a much higher percentage of what is in my closet. I rate the majority of my outfits as “8”s or higher and it’s very rare that I am unhappy with what I am wearing. When I am, I am usually able to quickly identify why and what to change the next time around. Debbie, I love these updates! I started the LIWI challenge with you in January, but weight gain (ugh!) pushed me off the wagon. At least, that’s my rationale. My closet is a mess. We’re sliding fast into cooler weather here, so I need to find motivation to restage my fall/winter wardrobe. I’m putting my smaller sizes away for three months, as I am determined to shed my excess weight. I had pared down a lot of clothes, and I’m afraid fear of deprivation set in. I feel like I’m hoarding both weight and clothes. If I had to hoard anything, I wish it was money, lol. Thank you for reminding us that it’s never too late to make positive changes. I am going to try LIWI with my fall/winter clothes and see how that goes this time around. I think it’s good that you put the clothes that don’t currently fit you away, Sandi. Seeing those clothes in your closet probably just made you feel bad. Fear of deprivation is a big issue for many of us, which is why I have been paring down slowly. I would prefer to hoard money over clothes and weight, too! Good for you for starting LIWI with your fall/winter clothes. I wish you all the best with it! Yes, it is never too late for us to make changes. Even if we falter (which I have many times), we can pick ourselves up and start again. As long as we are alive, we can make changes and turn things around! Great post. You really are honing in on your style with the LIWI challenge. I like the idea of the “probation” area of your closet. I still struggle with having too many clothes that don’t really fit my lifestyle and climate but they still “spark joy”. I guess I am a clothing museum curator! I was like Lori until very recently. This year I’ve been selling off and giving away all those items that I love but never wore. New things were still coming in of course, but more things were going out. For every new item, 3-4 items were either sold or donated. It took a long time to get over “the fear of deprivation” since I got rid of a huge amount in April. I still made many mistake purchases since then but not nearly as much as before. Now my entire wardrobe is 50 items but 39 of those are for fall/winter, which is still too much for my lifestyle and climate. There are a few items that I will always keep as ‘museum pieces’ and may wear them once or twice a year but I just love them too much to part with them. I do need to add 2 new dresses, 2 tops and one pair of sandals for next summer so I will have to be very careful and patient with my future purchases. I’m nervous about my shopping ban for the upcoming winter. My first time doing it after continuously buying for the past 5-6 years. It’s going to be very hard and I’m not giving myself any loopholes or justifications to buy anything new. I do have to remind myself that I have more than enough and if I get through the next 6 months without buying a single fashion related item, I will mark my first step of being a recovering shopaholic. Great point about things sparking joy but not fitting one’s lifestyle and/or climate, Lori. I definitely have some of those myself. I’m glad that Wendy shared her story, as it provides inspiration for many of us who have too many clothes that don’t get enough wear. I think putting some clothes “on probation” can help, as we will need to re-evaluate whether or not they serve our needs. I’m thinking that distinction is going to help me. Wendy, big congrats to you on your wonderful progress! You are doing SO great! I’m impressed that you have been able to pare down so much. Like you, I don’t need a very large wardrobe for my life and I know I still have too much. I think that working on bringing less in is a very important part of the equation that is often neglected. Otherwise, we end up paring down things that have rarely been worn and could possibly work for us. I wish you the best of luck with your shopping ban. You seem to be approaching it with a very good attitude. Please keep us posted on how you do. I’ll be rooting for you and I know others will, too! I can relate to Sandi! My closet also feels messy, i think from a combination of moving again and some fairly dramatic health-related weight fluctuations over the past year and a half. Standing in front of my closet trying to figure out an outfit, I think of the liwi approach: what would i like to wear? And dang, often there just isn’t anything. Limited options combined with the fact that every outfit must be built around athletic shoes… not impossible but I do find myself stuck more than I’d like to right now. Hopefully things will improve as our lives slowly settle in, my weight stabilizes and I find more of the right stuff. I’m glad you found my LIWI update soothing and therapeutic, Claire. I feel for you with your health and weight struggles. I have definitely had my share of both over the years and I’ve had times of not loving anything in my closet, either. Sometimes it was just the state of mind I was in rather than the contents of my closet, which may or may not be true for you. I feel for you about having to wear athletic shoes with everything. My hairstylist is in the same boat and she laments not being able to wear her old clothes after back surgery. I hope that things will improve for you soon and you will have more things to love wearing. Virtual hugs to you and best wishes! I really appreciate your supportive words Debbie, and the virtual hugs, which go really easy on my tender spots! Thanks so much. I love these posts Debbie and get so much out of them! I am still trying to pare down my oversized closet to reach the point where I can follow this process at the level you are doing. But, since finding your blog this summer, I put some of my summer clothing items on probation. Probation fell into two categories, things I have not worn this year and those items which are new, but have only been worn once (or not at all!). In a very short timeframe, a real pattern in what I truly love and wear emerged. I would estimate that 2/3 of the probation items have been purged. I could not part with these same items when I tried KonMari, because I thought they “sparked joy.” The other 1/3 are now either a true love or comfortable old friends, which I still want around a bit longer. My wardrobe is definitely two distinct seasons. I have started a probation list for fall/winter, if it ever arrives in Texas, we are STILL having 90+ days. I am looking forward to seeing how many of these items end up staying in my closet after I try to wear them. Great post and welcome back from vacation! You are very wise, Barb! Both you and Lori have seen a potential monkey wrench with the KonMari approach. I think a lot of us have things that “spark joy” but don’t work for our lives. The “probation” method can help us to see that, as you have noticed. I often find that I am “forcing” myself to wear things, even though I’m not supposed to be doing that with LIWI. Old habits can die hard, though. I suspect my experience with the probation items will be similar to yours. It’s still scorching hot where I am, too, and almost feels like Texas now. I hope that both of us will get to enjoy our fall/winter clothing soon! Thanks for acknowledging my positive changes, Terra. In answer to your question, I wrote a post about dressy wardrobe capsule a while back: https://recoveringshopaholic.com/dressy-capsule-wardrobe/ However, I don’t even have some of the items pictured anymore and my style has changed a lot since then, so I should probably revisit what I would wear for those rare dressier occasions. Maybe I will do a follow-on post or at least figure it out for myself. Like you, I only need a SMALL dressy capsule, far less than what I originally wrote about. Dressy is a relative term, as was discussed in the comments of my February post. I like the name you gave to your capsule! You mention weight loss, I have the impression it is a byproduct of your health issues. It doesn’t seem to me that you started off at a weight that was unhealthy, so it’s possible you may return to that weight again. When you list things that don’t fit because you’ve lost weight I wonder whether those things might be put aside for the future when you may weigh more. In regards this very issue, I’ve decided to hold on to clothes I still like and have found useful, but aren’t my current size. Many of my clothes have some “give” that allow for fluctuations, but it’s not always enough. I know this means I’ll be storing extra clothes for an undetermined amount of time, which I’m not wild about, but hopefully I won’t be caught off-guard again when I find myself dealing with weight changes and too sick to shop. I imagine this will make closet maintenance/culling more challenging, but I think I’d rather have a collection of items already on hand to choose from than deal with that awful situation again. Yes, my weight loss has been related to my health issues, Ginger. I haven’t lost a lot of weight but enough to make some pants a bit too baggy to wear. I am happy with my weight now (I’m at the low end of a healthy weight range for my height and body type), but I know it’s possible it may fluctuate again. I do plan to hold on to the baggier pants and I will still wear some of them if they aren’t too baggy. The ones I can’t currently wear have been placed in the “staging area” of my closet and I will keep them there for at least a while. I agree with both you and Claire that it’s better to pull out some old items than to have to go out and shop again. I have been plowing through the archived articles for the past two days and your stunning transformation is very inspiring. It’s also amazing to see someone who is capable of the type of data collection and analysis that you put forth into this project. It’s too bad you’re not in the field of change management or six sigma, because I feel like you’d be a natural. I do not consider myself a shopaholic, yet I’m a bit surprised that I do a lot of the behaviors (duplicates!) and run through a lot of the same thought patterns that I see here. Food for thought. I actually had a quick question for you. Do you ever reward yourself when you hit your targets? I was just wondering because it seems to me that you’ve hit a lot of your goals so I would think you deserve something! Heck I reward myself even when I fail, just for trying! Am I the only person who thinks this way? I read about this technique through the book “Feeling Good” that was recommended by my therapist. I’m very curious to hear if others do this sort of thing to motivate them, particularly those who are very ambitiously driving toward their goals. I really have appreciated sharing your journey and I love seeing your style shift and coalesce over time. Thanks for sharing! Thanks for your kind words, Joanie. I’m glad my posts have provided you with food for thought! In response to your question, I have used rewards for reaching goals in the past, but they have usually been shopping-related, which I don’t think is a good idea. Maybe I need to come up with some other rewards that I wouldn’t do otherwise. I read the book “Feeling Good” years ago and remember it being a good one. Oh my gosh! I stumbled across “Feeling Good” (by Dr. David Burns) at the library many years ago (in my 20s) and it helped me turn a corner in my battle w/ anxiety/depression. 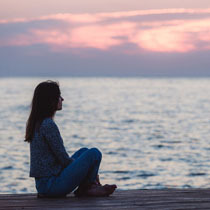 While it’s not a panacea, it’s teachings are a cornerstone in my coping toolbox, and as I’ve racked up chronic health diagnoses, its wisdom has always been there to help me along. A foundational cognitive behavioral therapy book (CBT) text for sure. I don’t do LIWI, more like “don’t love and so don’t wear it.” I have worn a few “iffy” items lately to see how I feel, I guess a version of “probation” and they have now been removed to “out.” I really try to only have items I wear and love. I do feel much happier with less but with things I love. My old inner-shopaholic was always looking for this perfect wardrobe that I would always love – it would be full of amazing clothes I adored. I’ve come to realize that what I loved last year may not be loved this year and there are things I loved 10 years ago that I still love to this day. It changes. A good reminder to buy what I love, wear often and enjoy and not buy things in an attempt to make something unlovable more loveable, and more does not mean more loved. I like Into Minds idea of choosing “proportions” as she calls it – or silhouettes/looks. Apart from some fashion changes, eg, bootleg/skinny, I have found that the proportions I love tend to be the same year in and year out and this helps to stick to buying styles which I know I like and which I know look good on me. I think it’s a good idea to wear “iffy” items and test them out, Carolyn. That is what I had in mind with my “wardrobe benchwarmer” project of 2013. I plan to either wear and test my probation items or just let them go if I never feel called to wear them. You made a good point about a “perfect” wardrobe being a moving target. I agree that we should buy what we love and wear it often. I also like Into Mind’s proportion idea. It’s kind of like the concept of “uniforms.” Some of my proportion preferences have changed recently, but I think I will probably love the ones I love now for at least a few years to come. I love these posts because I’m the type that enjoys the numbers! Just a simple question – what overlap is there between items worn one month and the next? I find I wear about 50/55 items over 3 months (excl shoes), but that there around 10 are carried forward from the previous season (so my total isn’t 4×50, but quite a lot less). In the UK there are quite big swings in weather, but even so transitional seasons (spring and autumn) can often borrow from winter or summer. This is a really good question, Alice, and I actually haven’t done that math. It would be a good post idea, I think. If I had to take a wild guess, I would say at least half of the items overlap from month to month, but it might be as many as two-thirds. We don’t get extreme seasons where I live, but there is some variation. In the next month or see, I think I will be rotating in more toppers to wear with skirts and dresses and I will probably wear pants and jeans more often. If I were doing Project 333, I think I would shift the terms a bit: November-January, February-April, May-July, August-October. That would work better with the “seasons” we have here. I see a post brewing – thanks for the idea! I guess I am much more (brutal? decisive?) about stuff that doesn’t work for me. If it doesn’t work just about immediately, out it goes — back to the store (if possible), to consignment, or to Goodwill. I don’t put stuff on probation. I don’t give house room for stuff that I don’t love and don’t wear every day (at least weekly or biweekly, depending on the season). I have one small closet and only the clothes I truly love and really wear go in it. What is important in your process (or anyone’s) is understanding WHY something doesn’t work to avoid making similar mistakes. It took me a very long time to realize that high crew neck tops don’t work for me (but I learned this about 30 years ago and have avoided crew necks like the plague ever since). And as I’ve gotten older, I’ve made further changes to my wardrobe — it’s slightly less formal that, say, 10 years ago. Sometimes it’s harder to find the kind of clothes that work for me — that that’s when I almost stop buying stuff altogether. Then there are times when the stuff I like is in abundance, and I tend to use these times to replace older clothes and update my wardrobe. I am still a “shopper” but I only buy what I need and what I know I will love and wear constantly. The days of experimentation are way behind me. I can definitely see that you are more brutal and decisive with your clothes, Dottie. You seem to have had a good sense of your style and what works for you for quite a long time. After years of buying too much and only wearing things a few times on average, I wasn’t at all sure of what I really wanted to wear. As I’ve been refining that, it’s gotten easier for me to pass things on. I have definitely come to understand why some things don’t work, but I’m still not totally confident that I will make the right decisions, which is why I am putting some items on “probation.” There aren’t many of them and the probation time will likely be short. It’s just another experiment that I’m trying to see how it goes and if it’s helpful. I have had multiple weight swings over the years and thus no longer get rid of pants that I love but don’t currently fit me. I have three sets of pants sizes and swap them in and out of my closet as my body shifts. Much easier than having to constantly get rid of and rebuy things. I stopped working in May and just discarded the majority of my dress clothes. Next on my hit list is shoes and purses. So far I have decided not to do anything about my large jewelry collection. I have stopped buying cosmetics and severely reduced my perfume purchases, and have also stopped buying books. Little by little I am trying to declutter and cut consumption down to 90% necessities, 10% wants. Good plan to keep the pants when you know your weight fluctuates, Tara. That’s why I’m keeping the ones I have that are too baggy right now, but I took them out of my “working closet” so they don’t “muddy the waters.” Good for you for discarding your dress clothes. Sounds like you are committing to your retirement. I may be retired, too, for all I know (and since we are the same age, you are helping me to feel better about it if that’s the case). I have few dressier pieces and am gradually letting them go, save a small capsule for the small number of dressy occasions that come along. Seems like you are making excellent progress! Good luck with the shoes and purses and with decreasing your overall consumption. I always find wardrobe challenges fun to do. I’m curious what your next challenge will be once this one is over? 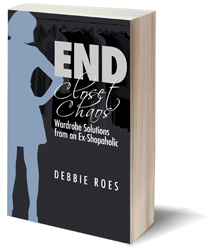 Learning about one’s wardrobe is an ongoing process and challenges help make it fun. I love wardrobe challenges, too, Lisa, and I’m glad you have taken on a new one for the coming year. I’m not sure what my next one will be yet. Still pondering, but I agree that the challenges make learning more fun. I just stumbeld over your blog and simply love it. I think you´re setting a great example here and you´re talking about a topic that affects a lot of women, because I think shopping has become a really big deal in our lifes (and too big for many of us). Your blog is a great way of showing how it can be done differently. 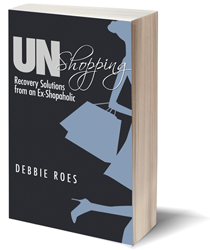 I just bought your book “Unshopping” on amazon and I´m looking forward to reading it. Welcome, Marisa, and thank so much for your comment and for buying my book. I hope you will enjoy and benefit from it. Congrats on starting a blog and taking on such a worthy pursuit of dressing with less. I look forward to checking out what you have to say. Best wishes!